The City of Pocomoke has experienced water quality issues for the last fifteen years. There are areas within the water distribution system that need daily cleaning and/or flushing in order to prevent taste, color and odor complaints. In addition, the overall conditions of the treatment plant, water supply wells and elevated water storage towers are in question. GMB assisted the City with a multi-tiered approach to improving the water system, detailed below. The sewer system was also included in the evaluation.  The collected maps were digitized and used to create a base map.  Specialists conducted field surveys to verify locations and collect missing data. 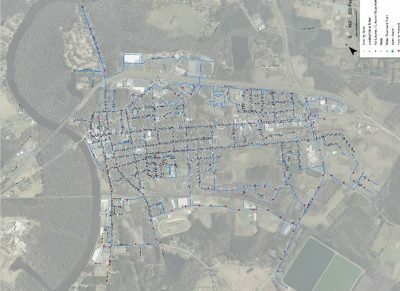  GMB prepared a comprehensive map detailing the public water distribution system (mains, valves, hydrants, towers, wells & treatment plant) and public sewer collection system (mains, manholes, clean-outs and pump stations).  The GIS digital files were used to import into a water modeling software program.  Field tests were conducted to calibrate the model.  The model was analyzed using existing conditions and proposed improvements.  GMB prepared comprehensive maps detailing the existing conditions and proposed improvements.  Conducted site evaluations at the water treatment plant, wells and elevated storage towers to evaluate the overall conditions of each.  Conducted site evaluations at each sewer pump station to evaluate the overall conditions of each.  Collected operations and maintenance records and analyzed. Prepared a printed report detailing findings, recommendations and estimated respective costs of corrective actions or capital improvements.